Literacy Volunteers of Bangor hosts an amazing tea party fundraiser each spring, including storytime with a Maine author and fun book-themed tables created by local volunteers. My kids and I have a great time participating, and this year we decided to create a table themed around Eric Carle’s “The Very Hungry Caterpillar.” But first, we needed colorful caterpillars. On Eric Carle’s website we found instructions for creating art in his unique style. 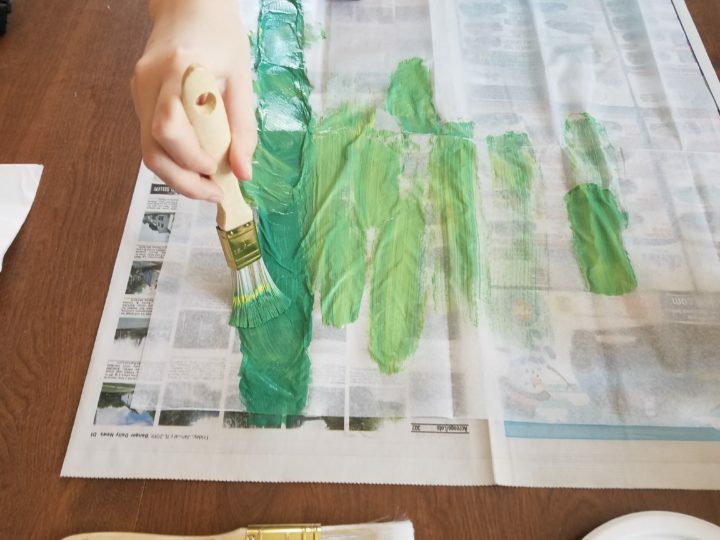 It’s a simple process of using watered-down paint on tissue paper, letting it dry and cutting out the shapes you need to create caterpillars, cocoons, butterflies and more. 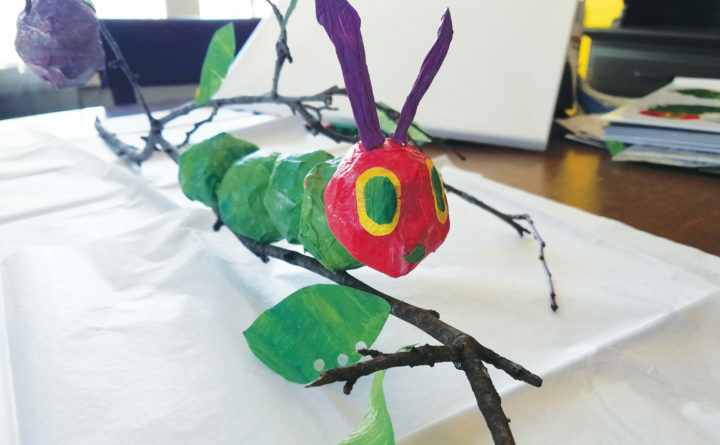 For our table centerpiece, we thought paper mache cocoons and caterpillars covered in the hand-painted tissue paper would create a fun Eric Carle-inspired decoration. We used an combination of white Elmer’s glue and water — just as fun and messy as traditional paper mache but a little easier to make. Give it a try at home and plan to join us Sunday, March 31, at the Literacy Tea. 1. Roughly mix your colors and water to create a streaky effect. Paint bold strokes quickly and gently on to white tissue paper. Lift the tissue briefly so it doesn’t stick, then let dry on newspapers. 2. Mix equal parts water and white glue to create a paste for your paper mache. You can go the more traditional flour paper mache route too, but we found this is much easier and it doesn’t mold. 3. We used small water balloons and squiggly balloons for the base of our cocoons and caterpillars. 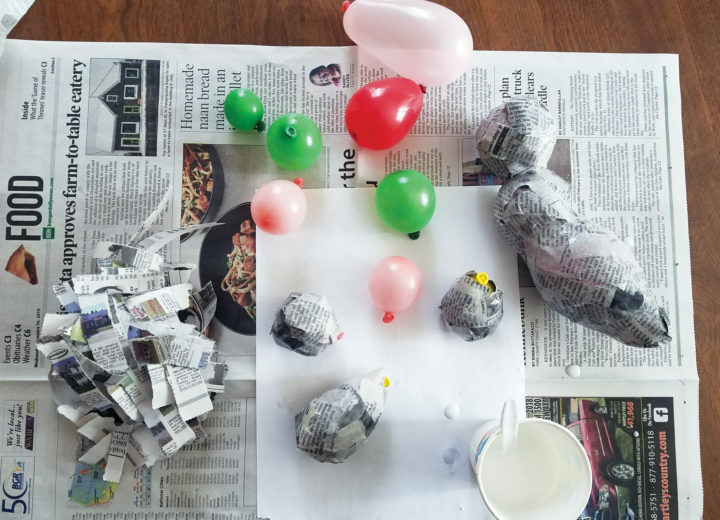 Tear strips of newspaper, dip into the paste mixture and smooth it onto your balloon. Apply about three layers worth of newspaper strips to the entire balloon, smoothing out the bumps as you go. Let dry completely. 4. Depending on your project, you can add another layer of paper mache using strips of white paper towels instead of newspaper to create a clean base. We found we could skip this step and our painted tissue paper covered the newspaper print just fine. We used Mod Podge craft glue to stick down the strips of the hand-painted tissue paper on the top and final layer. The Mod Podge gives a nice finish to the final layer. 5. Complete your creations by attaching the caterpillar bodies together with hot glue, then add eyes, antennae and other finishing touches. Attach to a small tree branch for a fun spring decoration. This story was originally published in Bangor Metro’s March 2019 issue. To subscribe to the magazine, click here.